Momma Told Me: Pie in the face. Up until I was 19 I'd always dreamed of tossing a pie in someone's face. It was a simple dream that really was born more from excessive cartoons as a child; and I'd envision a fluffy, soft, whipped cream pie lazily coasting through the air onto a friend or a loved one. I'd pause a moment to see if they'd be angry, and in the pause they'd wipe the sweet froth from their face, licking with a grin- and we'd all have a good laugh. Yes, it was a simple dream, until I had my own pie encounter of another kind. It was a crisp Spring afternoon; the Southern California sun was shining, in the distance birds could be heard chirping over the hum of playful squirrels, and I'd just finished baking a strawberry rhubarb pie for my best friend's birthday. I allowed it to cool, as I hurriedly finished my makeup and combed through my hair, hopping on one foot as I slid my feet into each heel. Somewhere the neighborhood kids were playing a Britney Spears song; it was an afternoon that would forever live in infamy. I collected the pie from it's resting spot on my counter, looped my purse through one arm, then headed out the door where the alleged pie and I sat in 34 and a half minutes of traffic until we arrived at our destination. Exiting the vehicle, I went around the front of the car to open the door, like a good gentlewoman, and collect my prized pie. Up, went the pie in my hand, closed went the door of the car, and around I spun with a few brisk steps towards the party's direction. Then the unthinkable happened, my right heel gave way with a loud crack, and forward I went onto the pie. It was not playful. I was not laughing. And the sugary mess was more of a choking hazard than a delicious treat. I'd been baking without protection, my pie had no cover. Sure, one of us would have come out of the scuffle a little worse for the wear, but neither of us would have been wearing one another. Where were Handi-Foil's Cook N' Carry Pie Pan and Lid Sets then? Momma certainly never had a disposable pie tin made from 100% recyclable materials she could trust to cook and transport her pastries in. 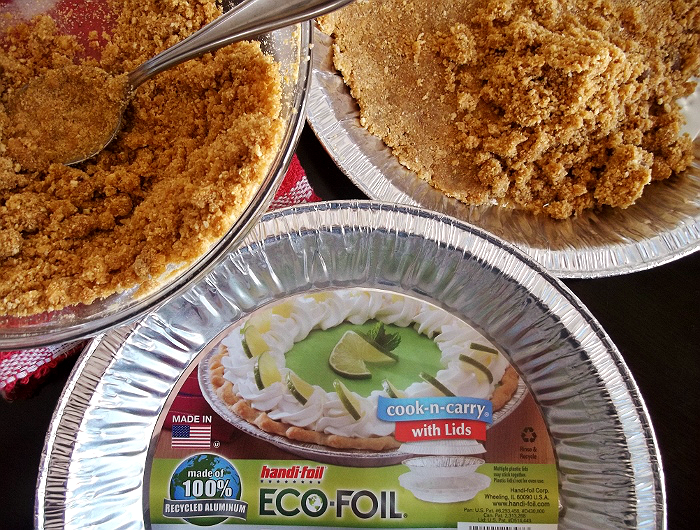 And, after several years of counseling, I have once again found my confidence in baking pies, thanks to Eco-Foil, by Handi-Foil's, range of low waste bake-ware. This Spring I plan on doing a lot of baking with Handi-Foil's 8x8 Cake Pans with lids, and my new favorite pie tin sets. The unique Cook N' Carry Eco-Foil Pie Pan and Lids offer a convenient plastic outer shell that snaps over the included foil baking tin. These three pieces work seamlessly to bake and transport pies without the fuss of common storage issues. Not only is the dome cover lid perfect for thick cream-based pies, but I can send leftover slices home in the carrying container as well. 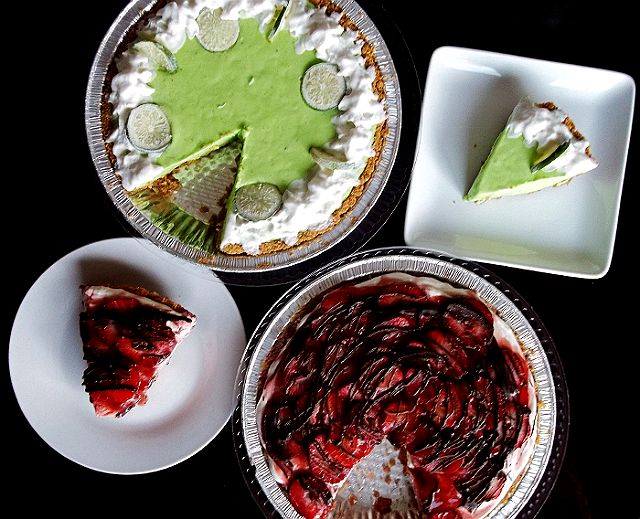 Now, the only question is which pie will I make, tangy Springtime Key Lime, or sweet and decadent Strawberry Cream? Try my recipes below and weigh in for your self, and fine the Eco-Foil range of bakeware nationwide at fine grocers such as Safeway, Food 4 Less, and Ralphs. 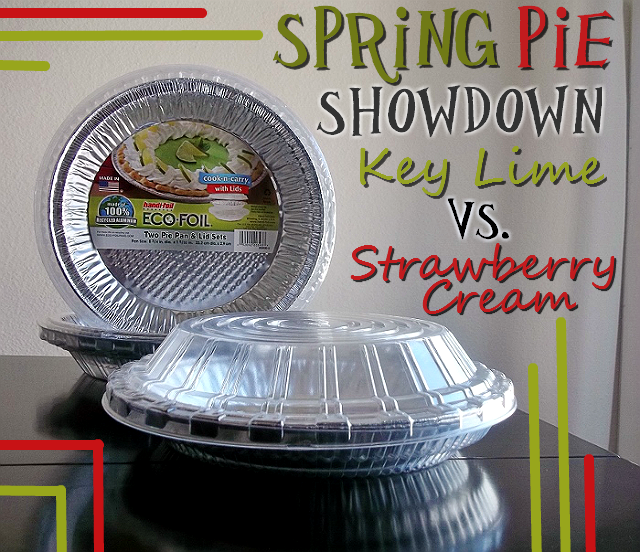 Key Lime or Strawberry Cream- what's your pick? 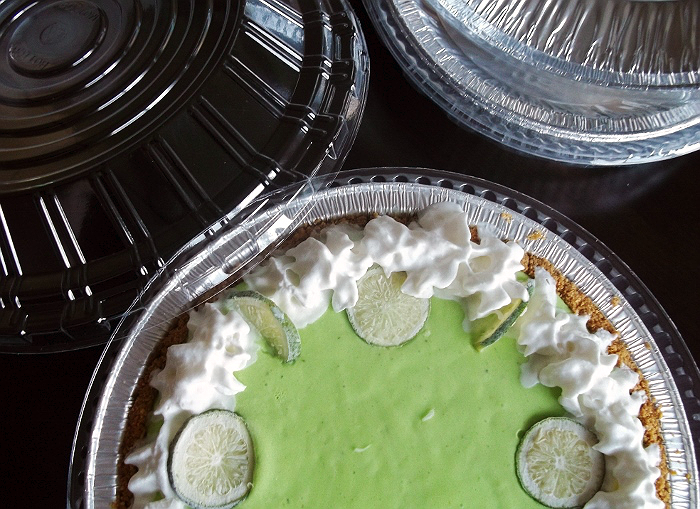 What Daughter Says: Keep your pie out of your face, and your face (and other things) out of your pie with convenient bake and transport-ware from Eco-Foil. 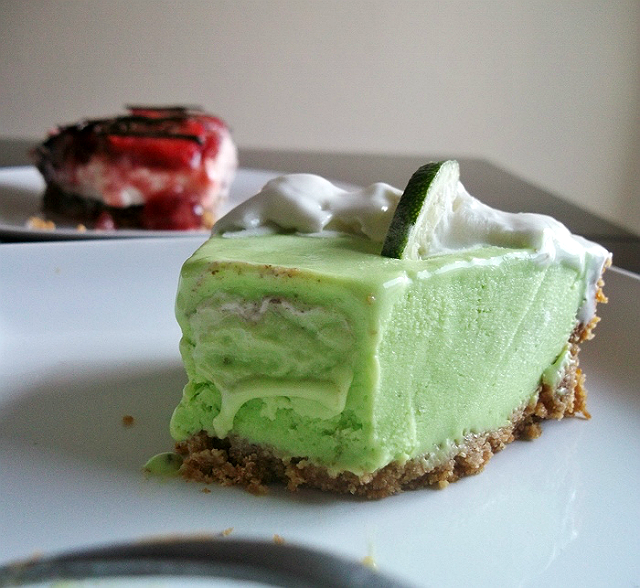 *** Click here for printable Key Lime Pie recipe. 1. In a medium bowl, combine graham crumbs, butter and brown sugar. Press the mixture firmly into the bottom of prepared 10" pie tin. Bake for 8 MINS, and let cool completely before adding pie filling. 2. In a large bowl, beat cream with an electric mixer until it begins to thicken. Gradually add sugar and condensed milk and mix until combined. 3. Beat in lime juice, zest, and half and half until mixture has reached desired consistency and flavor. 4. Gently spread pie filling over crust. Cover and freeze 4-6 hours, or until firm. Garnish just prior to serving. 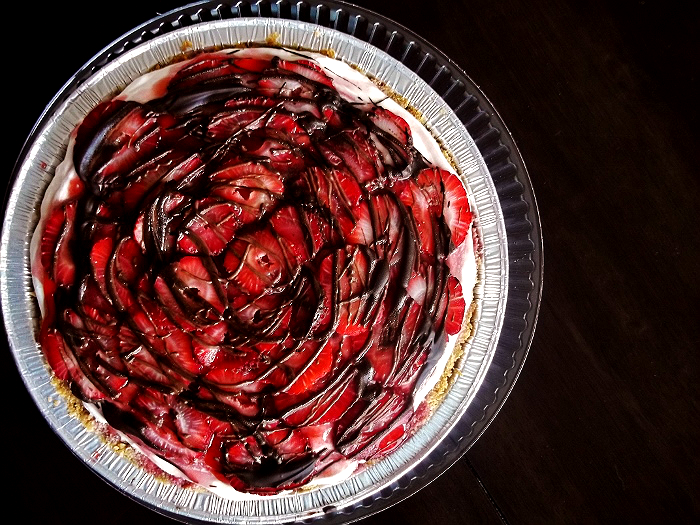 ***Click here for printable Strawberry Cream Pie recipe. 1. In a microwave, melt 3/4 C chocolate chips and 2 TSP shortening; stir until smooth. Brush over crust. Refrigerate until firm. 2. In a medium bowl, beat the cream cheese, sugar, sour cream, and vanilla until smooth. Fold in whipped topping. Add food coloring if desired. Spoon into crust, refrigerate 1 hour. 3. 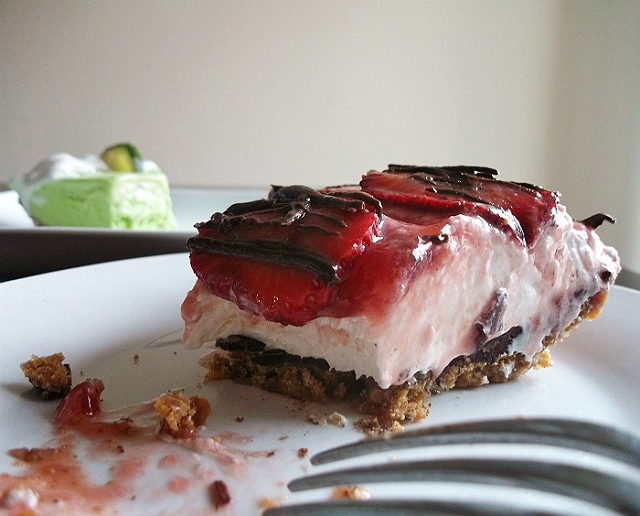 Arrange strawberries over pie. 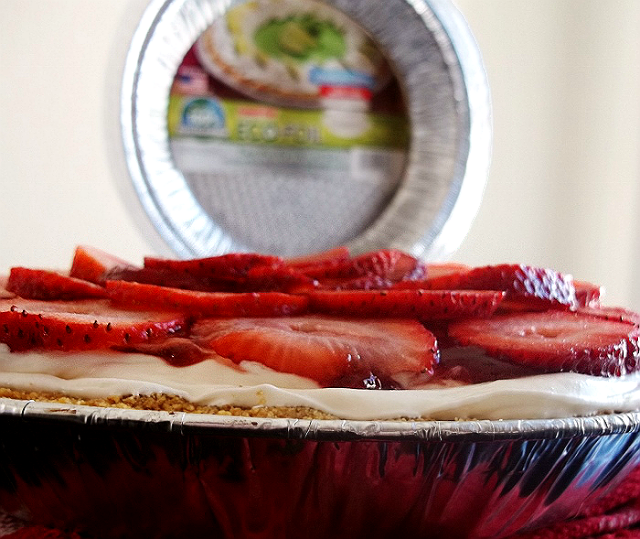 In a microwave, heat jam until melted; brush over the top of pie. 4. Melt remaining shortening and chocolate chips; stir until smooth. Drizzle over pie. Refrigerate until chilled. I'd have to bake both in this house as the hubby loves key lime and I adore strawberry. That is a funny story, although probably not so funny at the time. I'd choose strawberry cream. Key lime pie (and bread pudding) is one of the only desserts I don't really care for. Holy mouthwatering AMAZEMENT! I would love to try both. Like Patty, hubby likes key lime, but the kids love strawberry. I love both! Key Lime for me!!! I love Key Lime anything!!! But they both look amazing!